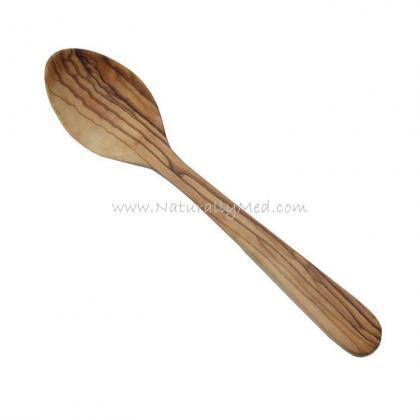 A lovely olive wood dessert spoon – 8″, an absolute kitchen essential. This wooden spoon has many uses… use it to eat your cereal, dessert, to serve jelly, to taste your cooking… The uses of this little olive wood spoon are endless. Measuring approx 8″ it has the approximate capacity of a dessert spoon. All of Naturally Med's olive wood spoons and utensils are made from a single piece of olive wood, never glued or joined wood. This makes our olive wood utensils range durable, hardwearing and long-lasting. This spoon is perfect for eating ice cream and yogurt.